I have a question I hope some of you can answer. Many tube amps are voiced for regular 6 string guitar and as such are deemed not suitable for PSG .Asuming you are going to use one of these "unsuitable amps " within its clean headroom zone then could the use of a graphic eq pedal between PSG and amp make that amp sound good and sweet for PSG.I realise it's speaker could play a part in its voicing ...I was thinking more of the amps eq section in relation to PSG and correcting any shortcomings with a pedal. 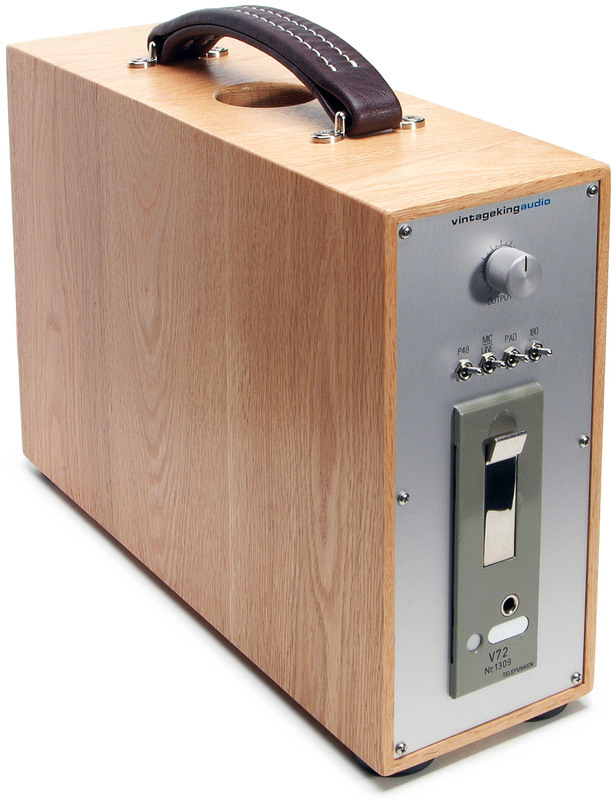 "Voicing" an amp simply means that it's been designed for some particular instrument. However, this "voicing" has (as far as we're concerned) less to do with the amp than it does the instrument we play. Straight guitarists have multiple pickups to play individually and combine, and get a myriad of tones. We don't have that. Therefore, it's sometimes necessary to expand the capabilities of the amp to compensate for our instrument's shortcomings. A mid-shift control goes a long way to do this, but an active graphic EQ just does more, IMHO. You can just get more sounds and tones with an active graphic EQ than you could ever approximate with standard tone controls. As to whether or not most players need that capability is another question, entirely. not just amps, many guitars are not the same. I use two , one being a simple 7 band and the other being a Baggs Venue. Mostly used to add some bottom end or tweak the bottom end. I play double duty pretty much all the time , ( AB Box ) amps are generally set for Telecasters and the EQ is used for the Steel. The Baggs Venue ( 4 bands with presence) also as a tuner so thats a plus. In addition it has front end input gain control as well as output level control. Lots of flexibility. I don't know if I agree that tube amps aren't "voiced" well for pedal steel. I feel like Lloyd Green's tone has been beautifully voiced for pedal steel for his entire career using standard Fender guitar amps. Worked well for Buddy Emmons and Tom Brumley too. The "voicing" pretty much points to the midrange, and 99.9% of the time, a steel player dips their midrange. This dip can be found as low as 375Hz and as high as 1kHz, often landing in the 700Hz range. On a Fender amp, the midrange frequency is a side-function of the treble knob. That magic Fender treble knob has worked tone wonders for pedal steel tone for over half a century. And my gripe with a graphic EQ pedal is that you're stuck with the specific few frequencies they've chosen. If you really want to help get more EQ control out of a guitar amp, maybe a 1-band parametric EQ pedal makes more sense. That way you can find the exact center frequency you're after, control the width (Q) of that dip, and just how much dip (or boost) you want. The combination of an amp's EQ and that parametric band should give you worlds of control. Well said Brad and I couldn't agree more. Some amps a graphic eq will help but never all I want. The parametric eq is the real deal. The parametric eq is the real deal. But also depends how loud you are playing. Mainly headroom or gain staging is the key. Distortion is a negative with clean PSG. The thing with Parametric EQ is you can search for an offensive frequency. Then reduce it if you understand this concept. I don't disagree and would never argue with Brad, but I use a 7 band EQ now and then because it can plug directly into the side of the Steel , takes up NO space , a very simple fast set-up and basically the only one that really cares about the FINAL tone is me ! I've been on this gig 2 x month for 4 years now. I can't think of even one time anybody commented about tone. Out of tune, bad notes , all that other stuff..yep, tone, nope. Basically a small tweak of the bottom end. My "gripe" is single channel moderate to smaller amps when I play double duty which is all the time . Under 30 watts generally implies loss of headroom for the Steel but sound great for guitars, over 50 watts implies too much IRON weight . I think the parametrics work fine if your main interest is dialing in a precise mid-shift frequency, or boosting or cutting only 1-3 frequencies. However, I like the added capability of a graphic to "comb" the EQ curve. I also think that graphic controls make it easier to visualize or "see" the curve you're dialing in. I agree with Tony and Donny on this. Sometimes the graphic is enough and works well for me, plus easier to see what you are changing. And used properly it will get you at a happy place. I use one for the same reason Tony does, double duty. The parametric eq is a more refined sound and taylors the detail to a smaller band without taking out too much of the rest of that band. It's for sure a trial and error to find what works best with your equipment. I have a Source Audio 7 band programmable graphic EQ. I bought it to help get some acceptable tone out of a MarkBass bass head. I was not successful in getting what I really wanted to hear. But I do carry both in case my Nashville 400 goes down. The good thing about this EQ is the ability to store 4 programs that can be selected. I was never able to get the dobro sounds that I get with other EQs. The center frequencies are different, but I admit that I didn't spend a lot of time trying as I have an another EQ set for a dobro. I agree, I've always loved the visual of a graphic EQ. But my gripe with the smaller pedals with only a few bands is that they likely are gonna miss that perfect frequency you want. Say a pedal offers a 400Hz and a 800Hz slider, but nothing at that 625Hz that I'm after. At least a single band parametric will let me perfectly find that frequency, control if it's a nice gentle and wide dip or a surgical notch to remove a specific resonance. And personally, I don't do that. I find that a well implemented Fender style tone-stack or a musical instrument EQ with a sweepable midrange is more than enough to shape a steel guitar tone. I can't help but to always point back to Lloyd, Brumley, Emmons, Hughey, Day, and others - simple amp EQ's that defined the glorious sound of the pedal steel guitar. In most cases it was just 3 knobs. Taking a tip from b0b I got one of these Q Strips and it is a very high quality and good sounding unit. Dual parametric EQ direct line out. The other day I was using a Vox AC30 for my guitar and it died 5 min before start time. I had to just run out to the board and using my Barber Tone press and dispatch master the Telecaster sounded fantastic. I would normally use this as a 2nd input tele into a steel amp. I will be playing ampless with the Tonkers for the foreseeable future. I used a PQ3 along with a Furman 1 space spring reverb unit for a rack system. I worked at a metal finishing company that anodized the front panels. I would give them specials spots in the schedule in exchange for free stuff. I used to have two PQ3's. For its time was a good parametric but by today's standards would be noisy. And it's only a 3 band so you would be either boosting or cutting. Granted you have the ability to choose more frequency combinations. 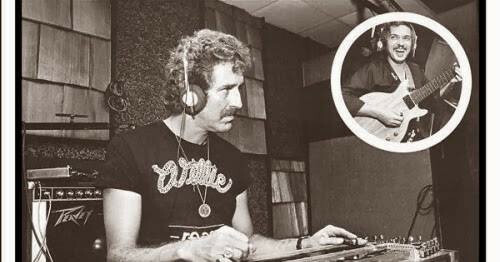 I have to agree with Tony and Brad that the fingers through a 3 knob Fender amp is where it started. I would say the amp you use is a basic starting point for tone. You can't make a silk purse out of a sow's ear by chaining an EQ pedal onto an amp that doesn't make your guitar sound good. •That's like making hamburger out of saw dust thinking a better grade of ketchup would save the meal, compared to starting off using grade A steak. Get a decent sounding amp would be my priority if tone is the quest rather than take a band-aid approach. 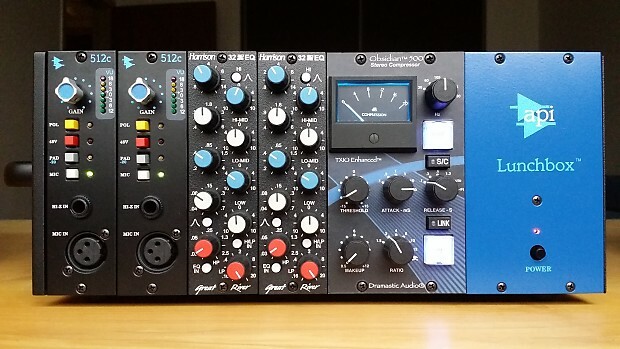 Today you can get lunchbox channel strips of channels from the old great studio mixers. Some guitarists use these to get classic sounds of the great recordings of the bygone days because the preamps in those mixers were the first thing seen in the chain. And then go into a decent amp. For EQ an API does wonders for shaping tone if you don't splurge on the Neve stuff. What amp are you using, Dave? Finding a decent-priced EQ unit to go with your amp would be trial and error as it is for everyone else. Something that would compliment your amp is key. Would help if your amp has an FX loop to patch the EQ pedal there. And as mentioned, your pickup is another link in the chain and is responsible for tone. Either the pickup is wrong for the amp or the amp is wrong for the pickup. We could then point to your guitar if it sounds good in the first place. They don't all sound the same. Malmsteen would go through dozens of Strats until he found one he liked. 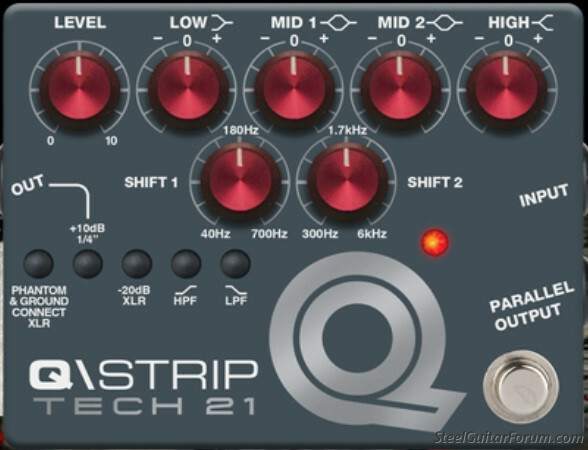 wow, that tech 21 Q strip is nice, never knew of it before this thread. Nice small footprint, AC power or 9 V battery. About $250 new. Looks great ! Plus excellent reviews. 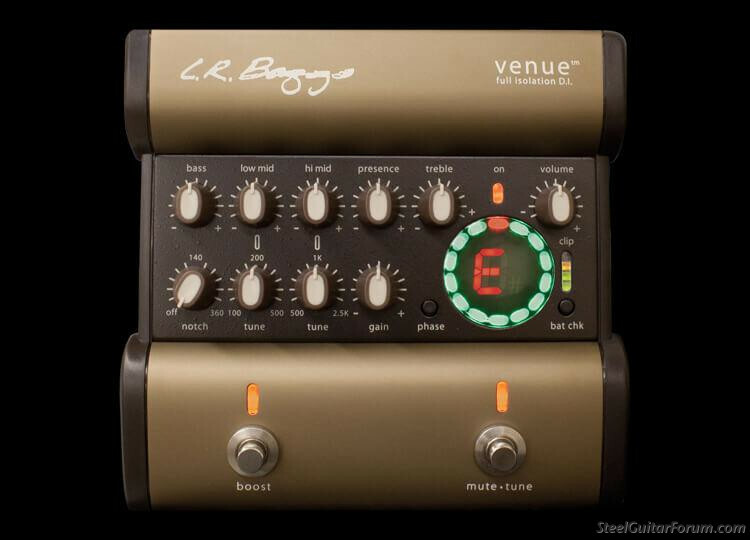 Comparison to the Baggs Venue, $299 new which offers a couple of extra options. I feel either of these would be a worthy consideration, but they also come with a price tag. I use a Venue for all acoustic gigs ( Guitar and Dobro ) and with the Steel now and then . I can see adding a Q strip to the gig bag and for DAW tracking, I set EQs ahead of the DAW and print to the tracks . Thanks for all the replies guys.It looks as tho an eq pedal ( last pedal on my board before amp) is a good idea.I am thinking of using my Laney Lionheart LT20 112 ( usually reserved for my Tele) for double duties at small gigs.It has 20 watts output with quite a lot of clean headroom,probably as much as a Deluxe Reverb. You mentioned putting the EQ pedal, in the effects loop. I have been wondering about that for a while now. I may have to try that with the MarkBass bass head that I have. For steel guitar, it is atrocious. Putting the EQ in front of the amp didn't help at all. The bass head has a switch to put the effects loop pre-EQ or post-EQ. Which would be best? I know I can try it and see what is best, but it's nice to get information from players who really know the "whys" that things work or don't work. Richard, it would be a matter of trial and error. Not all pedals are the same input/output impedances and sometimes an amp takes a pedal, sometimes not as the amp itself has its own in/out impedances. As far as pre EQ/post EQ is, again, try it and see if it works for you. Some FX loops have gain settings to accept a wider variety of pedals and insertion of effects. Some just have an in/out jack. Depends on how much design they put into the loop circuit. And they are all different. You may have to try different pedals until you hit one that works, even if going in front of an amp because the way these things are made it's never a one size fits all. At least your amp has options on the loop. Make sure you clean your FX loop jacks before connecting a pedal as those jacks tend to collect dirt from non-use. And in some amps, FX loops are known to cause intermittent volume problems just because the jack gets oxidized from not being used often. Lightly spray some of your fave cleaner in the jacks and make/break connection with your jack plugs several times in succession to dislodge any gunk that's settled in there. Do it with the amp off. I like to use a 9mm gun barrel bore brush, (plastic/nylon) to clean out most 1/4 inch jacks. You can use brass/bronze brushes but need to be careful, hairs from a metal variety does not lodge inside the amp/jack to cause a short. Which model/year Markbass is your amp? Would help knowing the specs on the amp to get an idea of how the FX loop is set to work. If after swapping pedals and insert positions, you can't get the amp to sound the way you want, you may want to try another amp as another solution rather than investing more time and money on something that won't cut it for your steel. If you're trying to get "sparkle" out of your Markbass by using an EQ pedal, it may not happen off the bat and with basic pedals. Some amps are a one-trick pony and maybe the Markbass is too flat or harsh sounding for your tastes? When you say the sound is "atrocious" for steel, what about the amp is it not producing? The sound is too (what many call) sterile. No warmth at all. Even my Peavey has a little warmth. Not trying to make it sound like tube amp warmth, but a little life would be nice. The tone just isn't there. It has 2 mystery controls marked VLE and VPF that affect the tone, but I haven't found them to sound good. We bought the amp from Musicians Friend last year hoping to get the weight factor down as I have a bad back. It is a Little Mark 250 Black Line. I still plan to use my NV400, and this is small enough and light enough that I can carry it as a backup. My NV400 is split into a head and speaker. The case I have for the head also has room for the MarkBass. Thanks for the reply. I will try the trial and error approach. Richard, I think the unit you have was designed to produce controlled bass frequencies. I heard a demo of the model you have and can tell that it sustains long enough for bass guitar notes. Hence it may be lacking the sustain needed for steel. Back in the 70's, we used to use a Phase Linear power amp for bass because the circuit design lent itself to controlling the movement of the speaker, "gating" the speaker movement to ready it for the next note. Short notes are easier for bass guitar vs long speaker overhang. I don't think an EQ pedal would change the character on your Markbass. You would be able to EQ but the short controlled notes the Markbass seems to want to produce will still be the same. 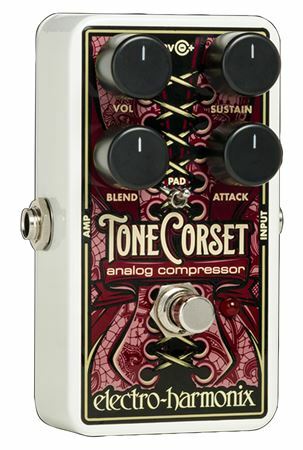 Perhaps a compressor-sustainer might fare better, but then it might not come out clean enough for steel if you like the traditional clean tone. Something like the Tone Corset? You're trying to cut down on the weight is reason you chose the Markbass. But for steel it may not be ideal. So often do solutions not follow right away for certain needs. An affordable lightweight steel amp is something that will come down the line. Till then, improvisation is our friend. I definitely don't agree that tube amps aren't voiced well for pedal steel. Of course, it depends on which tube amp you're talking about, but a tube amp that gives a good clean spanky sound for guitar generally sounds good to me for steel. The reason I like a Session 400 over all the other pedal steel amps I've tried is that it really does get a nice Twin Reverb vibe. But to me, the Twin Reverb and Deluxe Reverb have an ideal sound for their respective volume levels. With the Twin, I have to carefully dial in the tone controls - as Brad suggests, middle and treble controls interact. I almost always push the midrange up on a Twin. If it can keep up, the Deluxe pretty much has a perfect pedal steel sound with very little muss and fuss, to my tastes. 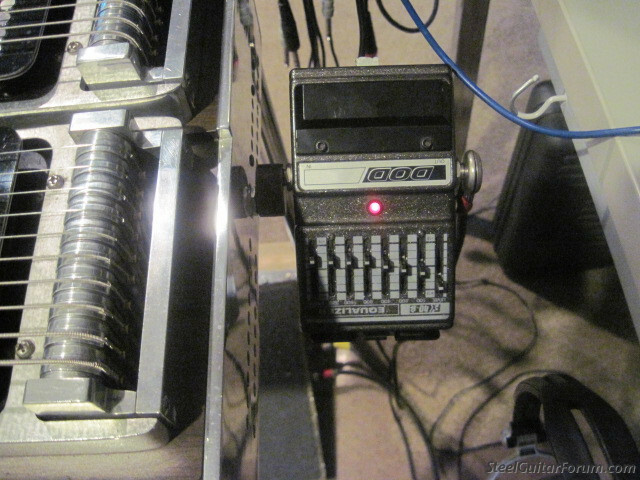 I used a Furman 3-band parametric EQ for some time, more for guitar than steel. To me, the less diddling with EQ the better - if the amp doesn't sound good, making extreme EQ adjustments is more or less polishing a turd. But lightly EQing using a good parametric can sometimes add a lot without adding a lot of noise. In fact, noise is probably my biggest beef with graphic EQs, especially of the typical stomp box variety. Every band has a separate parallel band-pass/cut filter adding to the noise floor. I had a Boss GE-7 modded with low-noise chips to help, but it was still meh to me. I'm sure not gonna deal with a 15 or 32-band graphic. I also think that heavy EQ messes up the phase response, something often not properly considered IMO. I just don't think any of this is really necessary if the amp has a good clean, spanky sound at an appropriate volume. Easy enough to cut a bit of spank if necessary, but hard to artificially add it if it isn't there in the first place.